Many-valued logics were developed as an attempt to handle philosophical doubts about the "law of excluded middle" in classical logic. The first many-valued formal systems were developed by J. Lukasiewicz in Poland and E.Post in the U.S.A. in the 1920s, and since then the field has expanded dramatically as the applicability of the systems to other philosophical and semantic problems was recognized. Intuitionisticlogic, for example, arose from deep problems in the foundations of mathematics. Fuzzy logics, approximation logics, and probability logics all address questions that classical logic alone cannot answer. All these interpretations of many-valued calculi motivate specific formal systems thatallow detailed mathematical treatment. In this volume, the authors are concerned with finite-valued logics, and especially with three-valued logical calculi. Matrix constructions, axiomatizations of propositional and predicate calculi, syntax, semantic structures, and methodology are discussed. Separate chapters deal with intuitionistic logic, fuzzy logics, approximation logics, and probability logics. These systems all find application in practice, in automatic inference processes, which have been decisive for the intensive development of these logics. 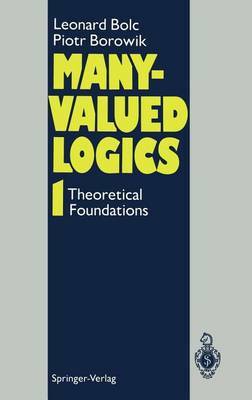 This volume acquaints the reader with theoretical fundamentals of many-valued logics. It is intended to be the first of a two-volume work. The second volume will deal with practical applications and methods of automated reasoning using many-valued logics.